Founded in 2006 from merge of some subsidiaries of Import-export Intimex Corporation as decision of Ministry of Commercial, Intimex Hanoi production and trade Joint Stock Company (Intimex Hanoi) was born and now has become one of the biggest company with the business model of diversifying many fields in Viet Nam. Name and Trademarks of Intimex Hanoi has been known over hundreds of countries around the world. As one of the member of Intimex Corporation, basing on experience of diversity big corporation and traditions in production import-export and retainer at dosmetic market and the capital resources, human resources, trade secret, Intimex Hanoi now expand and develop many business areas in order to meet the needs market inside and outside the country. With the aim to provide the best products, satisfying the maximum demand and enhancing competitiveness in the market, Intimex Hanoi have applied the system management professional management system and high quality human team, these are always a firm foundation to help Intimex Hanoi beak through in the new period. Intimex Hanoi is known as one of the leading Vietnam’s exporter in the field of agro-products with contribution of about 50 million USD.Intimex Hanoi are exporting the agricultural production of Vietnam with high advance competitive such as coffee bean, pepper, cashew nuts, natural rubber, all kind of tea. Especially, INTIMEX Hanoi become one of the biggest exporters of coffee bean and pepper bean in Vietnam with 15.000 tons and 25.000 tons respectively per year. 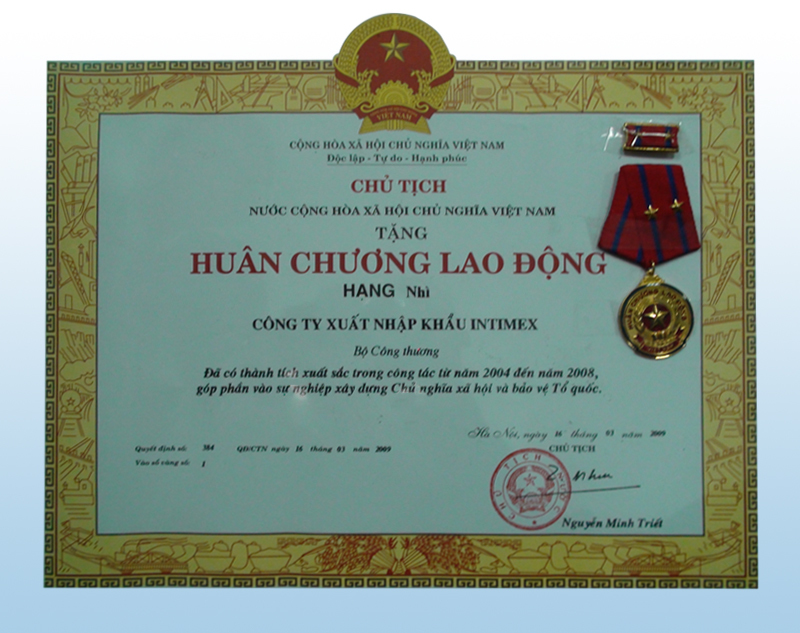 Especially, Intimex Hanoi has been a " pretigious exporting enterprise" award by Ministry of Trade in the field of coffee bean exporting activity. Besides activity of exporting the agrocultural product, Intimex Hanoi has expanded and developed importing and distributing field and producing garment. Intimex Hanoi’s image has been recognized by people. VisionBringing the image of Intimex Hanoi all over the world and became the biggest exporters in Viet Nam. Opening the new markets, diversify the range of importing products, expanding the domestic distribution system in order to contribute the economic and social development and integration of Vietnam. Intimex Hanoi Production and Trade JSC Co. Address: 19/31 Phan Trong Tue street, Thanh Tri, Ha Noi, Vietnam.